After a week of traveling and eating out I am back to cooking. A home made meal, a cup of a warm soup on a chilly night and a few out of the oven peppers are a must upon our return. If we were coming to my parent's home, that's what my mother would have made for us. It's her signature "Welcome" dish (see the second photo from the top on the linked page) for many-many guests in our home. 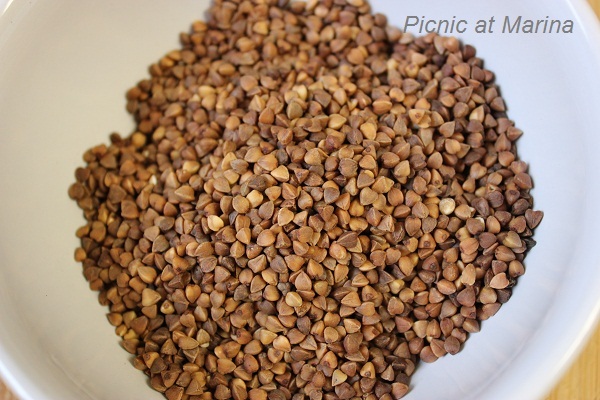 Gluten Free option: skip the barley and add a whole cup of buckwheat. For Meat lovers: when mixing grains and tomato/carrots/onions mixture add 300 grams (a little over half a pound) grinded meat of your choice. Then you will need to adjust seasoning and use 3-4 more peppers. 1. Wash and pre-soak rice and buckwheat in hot water for 20-25 minutes. 2. Wash and pre-cook barley (bring it to a boil and simmer for 15 minutes). 3. On a high heat pre-heat oil in a large skillet, turn it to medium-high and add onions. Sprinkle with salt and stir for about 3-4 minute (until onions become translucent). 4. Add carrots, and stir for another 3 minutes. 6. Drain all grains and combine in a large bowl. 7. Add the tomato/onion/carrot mixture to the grains and mix well. 8. Add 1 teaspoon salt and grind some pepper (about 1/2 teaspoon). Add chopped lovage, dill, and mix again. 9. Fill all peppers. To make it easier, I place peppers in the Dutch oven and then fill it. 10. 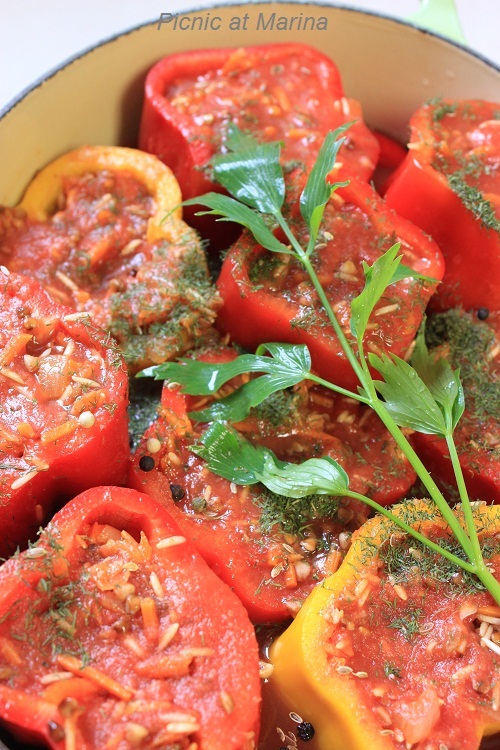 Pour 2 cups tomato juice, 2 cups water (or vegetable stock), and a teaspoon of salt over stuffed peppers. 11. Cover and bake on the middle rack for 60-70 minutes. Then take the lid off and check grains for doneness. It may need another 10-15 minute in the oven (depends what rice you use and how you oven bakes). 12. Serve stuffed peppers with some cooking juice and sour cream (optional). I really enjoy the addition of buckwheat here---and what pretty colors, well done! 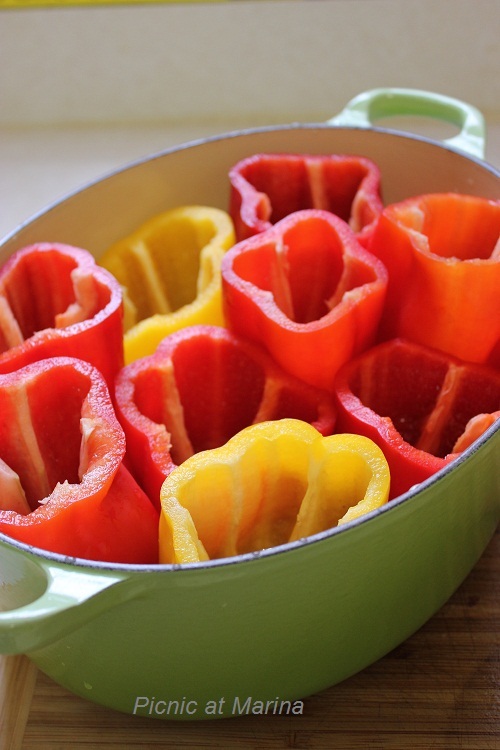 These peppers look wonderful! I haven't made stuffed peppers in a long time, and never like this. I will have to give these a try! I love barley your mom taught you well these are wonderful! Marina, I love barley so much!! 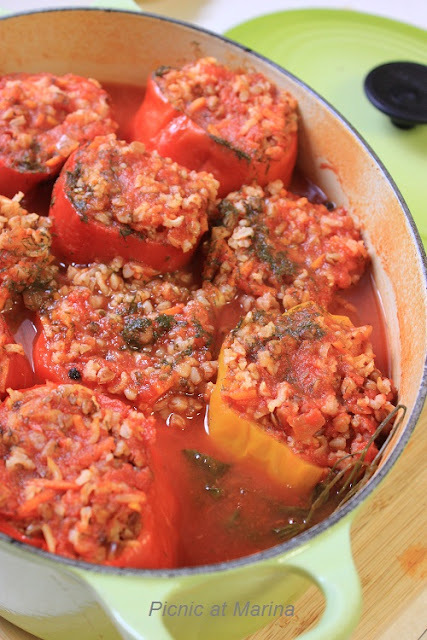 This recipe is very interesting, not your usual stuffed peppers. I will try it next time this amazing stuffing from your family recipe. Have a good day! Those look delicious and have lots of my favorite ingredients. I'm going to give these a try! thanks marina--i have been thinking about what to make, that i haven't done in a while---these look great! I love the different color of peppers! Very pretty! beautiful "happy" dish. I mean to do stuffed peppers every time I buy them. Thanks for sharing. Your Mom sure knows how to cook. Love the combo of barley and buckwheat. I don't see many recipes with buckwheat these days (other than pancakes). Looks wonderful! I see you have your signature dill as a flavoring, but the lovage looks lovely too. Really nice - thanks. This is a great "Welcome" dish, very comforting. Your Mother chose wisely. My Mom used soup to welcome me and my Zia cooks risotto. Seated at the table, it means you're home! These look amazing! Love stuffed bell peppers! And the smell of roasting peppers is amazing! Buckwheat! Certainly an interesting recipe! I love stuffed peppers. We stuff tomatoes and peppers in Greece with rice and ground meat!These peppers with the barley and backwheat look totally finger licking! This sounds fantastic. I love the idea of this, so nice that it's your mum's welcome meal! Beautiful peppers! Sounds even healthier with barley and buckwheat. What a perfect home cooked meal after the traveling! Oh my those look so delicious. You know I don't think I've ever had a stuffed pepper? Where have I been? I just might have to try your recipe especially because this is the perfect time of year for the comforty foods. My husband LOVES stuffed bell peppers. This is a great time of year to serve them with the ripe peppers that are in the stores! Thanks for sharing the recipe!